Selecting HVAC Equipment to Control Humidity in Commercial Buildings | AccuAir Inc.
Humidity control is an important aspect of maintaining occupant comfort and providing satisfactory air quality. In sub-tropical climates such as Florida, maintaining acceptable humidity levels is far more challenging than other parts of the US. Many of us have had the unfortunate opportunity of experiencing high humidity conditions in a building. It starts with occupants seeing signs of mildew, sticky papers, condensation at diffusers and a cold, clammy, uncomfortable feeling of mugginess, and often smells associated with dampness. Over the years we’ve learned the intricacies of humidity loads and how incorrect HVAC equipment selection could result in additional costs, customer complaints, and even lawsuits due to high humidity. I’d like to share with you some of the basics regarding understanding humidity loads and selecting equipment properly. As the Bard Engineered Products Distributor in Florida, AccuAir’s team has the pleasure of reviewing building design conditions and making equipment selections on a daily basis. I hope you’ll find this article informative, and if nothing else, provide you a little direction for your next commercial project with a high humidity load. Let’s start with the basic understanding of loads and equipment selection. A load is comprised of two types of load, sensible load and latent load. In simple format the load formula is Total Load = Sensible Load + Latent Load. In laymens terms, sensible load is the load associated with changing dry bulb temperatures whereas latent load is the load associated with heat contained within water vapor (moisture in the air). Historically, professionals have selected HVAC equipment based upon total load only, not taking into consideration the proportion of sensible versus latent load making up the Total Load. For instance, most HVAC professionals are familiar with the following calculation: If the sensible load is 30,000 BTU/HR and the latent Load is 12,000 BTU/HR, the total load is 42,000 BTU/HR and therefore a 3.5 ton (42,000 BTU/HR ÷ 12,000 BTU/HR per Ton) unit is selected. This simple method of selecting equipment based upon total load is acceptable in most residential and some light commercial applications. But watch out when working with many types of commercial buildings as the ratio of sensible load to total load and ratio of the equipment’s sensible performance to total performance may be drastically different and this may result in the wrong equipment selection! When selecting equipment for a building with a medium to high humidity/latent load the professional must consider total load and latent load. A detailed discussion and instruction of loads and equipment selection is not the topic of this article. In short and just for starters, selecting equipment requires a full understanding of sensible/total ratios, varying equipment performance at different inside and ambient temperatures, and varying performance of systems at different evaporator airflow rates. Rather the takeaway should be that if you are working on a project with either significant ventilation or occupancy load and you do not routinely work with these scenarios, seek the help of another professional to assist with equipment selection. We at AccuAir do this for all Bard Engineered Products, and most other manufacturers’ representatives and/or distributors and their professional sales engineers can also guide you in the right direction. Maintaining Humidity at Part-Load/Non-Peak Conditions – Just as important as selecting HVAC equipment at peak design conditions, understanding how to maintain temperature and humidity at part-load/non-peak conditions is of paramount concern, especially in Florida. Too often nonpeak design conditions are not considered and it is these circumstances where humidity issues may arise. Since HVAC cooling equipment is generally selected based upon peak design conditions, equipment is often simply oversized for a significant portion of actual operating periods. Peak loads may only exist for 10%-20% of operating periods resulting in insufficient compressor run time to properly satisfy the humidity load during the remaining hours of operation. Standard commercial HVAC systems dehumidify during cooling periods when the compressor is operating and moisture is condensed and drained at the evaporator coil. But, often a standard commercial HVAC system only monitors temperature, and thus only dehumidifies when the thermostat calls for a cooling period. Simply put, when the thermostat does not call for cooling the system is not providing dehumidification. It is during these non-cooling/non-peak periods when there may be an issue, as the ventilation and/or occupant humidity load remain present and thus humidity may rise to an unsatisfactory level. This problem is compounded when continuous blower operation is required to achieve code required outside air ventilation rates. So how do you maintain humidity during non-peak periods? It’s simply called “reheat”;, together with a controller that monitors both temperature and humidity. A humidity controller (dehumidistat) should be used to measure room humidity levels and provide a control signal to the HVAC equipment when dehumidification is required (normally recommended when humidity is at or above 55%- 60% RH). During “reheat” or dehumidification mode, the HVAC system will simultaneously operate the compressor to condense and remove air moisture at the evaporator coil while reheating the air to an approximate room temperature prior to discharge. This operation results in a dehumidification mode that reduces humidity while maintaining room temperature. Historically there have been two methods of reheating the air, one being electric reheat and the other being hot-gas reheat. Electric reheat is no longer permitted with current energy codes as electric reheat requires compressor and simultaneous electric resistance heat operation, resulting in very high energy use. Today the energy code generally requires reheat be provided with hot-gas reheat. This is accomplished with the inclusion of an additional refrigerant coil/circuit in the HVAC equipment. 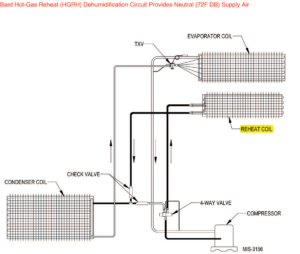 This circuit allows a portion of the hot- gas leaving the compressor to bypass the condenser and be delivered to the reheat coil located downstream of the evaporator coil. Unlike the evaporator coil, the reheat coil does not have an expansion valve or metering device and so the injected hot gas refrigerant passes through the reheat coil and the passing airflow is reheated prior to being discharged from the unit. Using hot-gas from the compressor to provide reheat results in no additional energy usage in comparison to operating in cooling only mode. In summary, adding hot-gas reheat to a commercial package unit is a relatively low cost option, especially when considering the great operational benefit of a dehumidification mode. This will ensure that your occupants are able to work and function at optimal humidity levels, independent of temperature. For the contractor or design professional, providing hot-gas reheat is an inexpensive insurance policy specifically for those periods of time or seasons when the building is operating at non-peak conditions. AccuAir is Bard’s Florida Engineering Product Distributor for the entire line of engineered wall mount and interior mount commercial package units featuring hot-gas reheat, for both air conditioners and heat pumps. Best of all, hotgas reheat is available in single phase equipment. We operate from the Florida Keys to Tallahassee and we would be pleased to assist you with your next commercial project. For more information about Bard’s full line of packaged HVAC units featuring HGRH dehumidification please contact…Frank B. Suranyi, MBA, Member ASHRAE – Engineered Products Manager, AccuAir, Inc.